Whether you like it or not, the chances are that email is an inseparable part of your daily routine. Not that things were radically different ten years ago, but now we’re also bombarded with social media messages, app notifications, and many other sources of distraction. As such, the importance of effective email management has never been more obvious. Are you one of those people who shiver in disgust at the sight of an email notification? Do you often find yourself postponing reading new emails for as long as you possibly can without risking losing your job, friends, or spouse? You’re not alone. Countless people just like you commit the gravest email management sin of all every day: they don’t check their email regularly. As every professional personal email manager would tell you, it’s essential to develop the habit of checking email every day, ideally at the same time. Why? Because doing so minimizes the chance of your emails piling up and eventually reaching the point where it’s no longer possible to read and reply to every single unopened email without taking a day off work. We recommend you check your emails at least twice a day: once early in the morning and at the end of the day. It’s also a good idea to use your smartphone to reply to new emails throughout the day whenever you have a few minutes of free time. Modern email clients and services provide you with a whole arsenal of handy email management software tools, and you should take as much advantage of them as possible. Create folders for each category of emails you receive and use smart filters to move new emails to appropriate folders for you. Prioritize the folders and always check the most important ones before you move on to those you deem to be less important. Sometimes subjects don’t give enough information to instantly tell what emails are about, but visual labels always do. If your email client allows you to color-code emails based on the sender, category, or, for example, priority, make sure to use this feature. There’s one easy trick how to receive fewer emails: minimize the number of emails you send. As you might expect, the fewer emails you send to other people, the fewer replies you will likely get. Once you start thinking about it, you might be surprised by just how many emails you send are unnecessary. Some things don’t need to be said at all, while others are better handled in person as it would take dozens and dozens of replies to say what can be said during a minute-long discussion. Snoozing every opened email you don’t have time to respond to or otherwise handle is a lot better than simply leaving it opened in your inbox. What typically happens when people don’t use the snooze feature is that they lose track of which emails they’ve already replied to and which still need their attention and inevitably waste time backtracking. Just make sure not to snooze an email by accident as you might miss an important deadline and make someone angry at you. There’s a number of reputable email providers offering their services for free. Some focus on features and convenience, others try to entice users with unlimited storage space, and some are privacy-oriented, featuring strong end-to-end encryption and robust 2-factor authentication. As such, there’s really no reason to have just one mailbox for everything. Managing email becomes much easier when you can use one mailbox for work, another one for personal matters, and yet another one for shopping and online services, for example. With multiple mailboxes, it’s fairly easy to lose track of new emails, but that’s where email clients such as Microsoft Outlook or Mailbird come in. A good email client makes it possible to consolidate multiple mailboxes into a single unified mailbox, so you can see all your emails in one place and handle them more efficiently. One of the most important email management tips in the world is to clean up your mailbox from time to time with Clean Email, a sophisticated yet easy-to-use inbox cleaner that organizes all your emails for you by grouping them into easy to review bundles. Clean Email presents you with a number of options how you can clean the groups of emails. For example, you can remove them, archive them, label them, mark them as read or unread, add and remove stars, and much more. 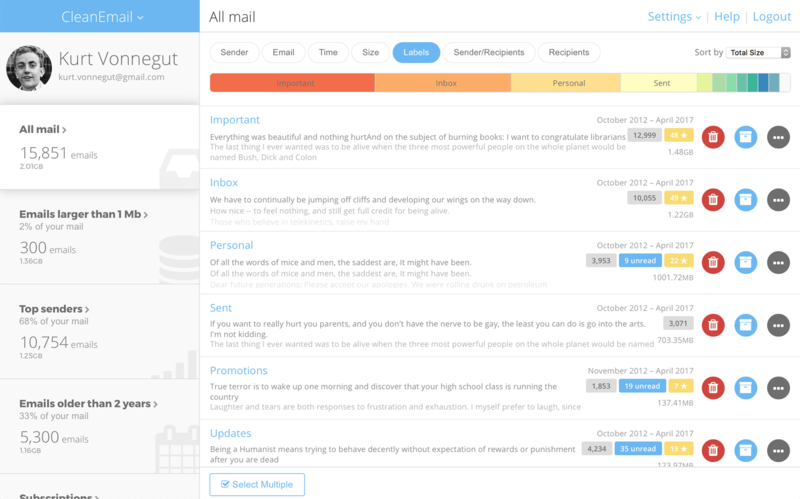 You can try Clean Email for free to see what it can do for you. To use it, simply sign in with your email address and let it do what it does best. 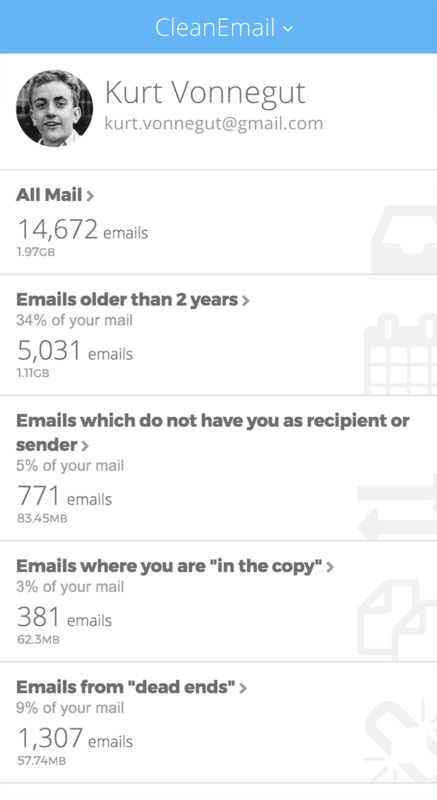 Because Clean Email never touches the actual content of your emails—only email headers—there’s no reason to worry about your privacy and security either.